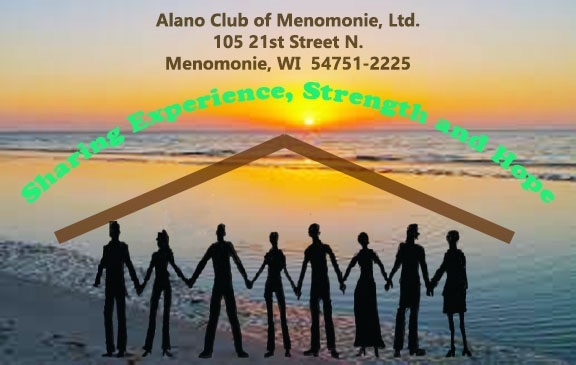 Alano Club of Menomonie. Ltd.
105 N. 21st. St., Menomonie, WI. Conveniently located near the hospital. Turn North off Stout Road (Hwy. 29/12) at the stop light on 21st St. and go one block. We are on the left, across from the hospital. A place for people interested in recovery from addiction to gather, seek support, and have fun. A place for recovery meetings. A quiet place for reading and meditation, sponsor/sponsee meetings, etc. A safe, sober place to go when the bar scene is too much. A place for fun and inspiration - pizza night, speaker meetings, videos, and potlucks. (C) 2013-2018 Alano Club of Menomonie, Ltd.